DA Form 5678-R or the "Policy Statement And Memorandum Of Understanding For Participation In The U.s. Army Potential Contractor Program" is a Department of the Army-issued form used by and within the United States Military. The form - often incorrectly referred to as the DD form 5678-R - was last revised on February 1, 1998. Download an up-to-date fillable DA Form 5678-R down below in PDF-format or look it up on the Army Publishing Directorate website. 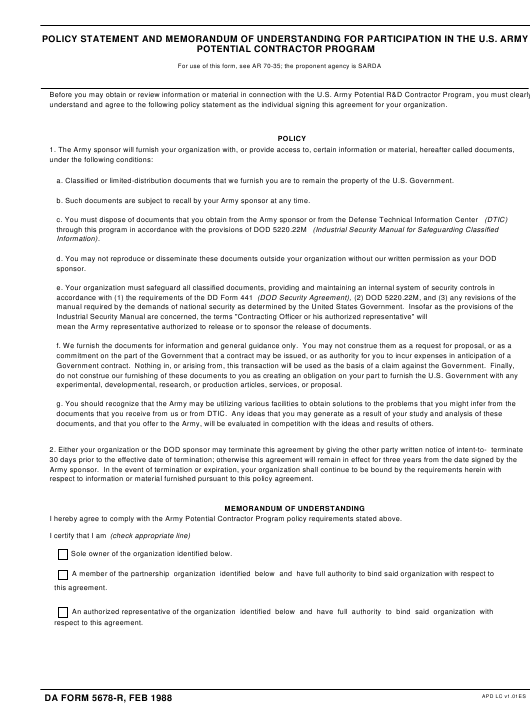 understand and agree to the following policy statement as the individual signing this agreement for your organization. a. Classified or limited-distribution documents that we furnish you are to remain the property of the U.S. Government. b. Such documents are subject to recall by your Army sponsor at any time. mean the Army representative authorized to release or to sponsor the release of documents. experimental, developmental, research, or production articles, services, or proposal. documents, and that you offer to the Army, will be evaluated in competition with the ideas and results of others. respect to information or material furnished pursuant to this policy agreement. I hereby agree to comply with the Army Potential Contractor Program policy requirements stated above. Sole owner of the organization identified below. Federal Government from bidding for furnishing materials, supplies, or services to the Government or any agency thereof. accompanying DD Form 1540 (Registration for Scientific and Technical Information) . used only when documents are required to pursue R&D towards Army goals. who signed the above agreement on behalf of the corporation. of the corporation and has the authority to bind the corporation with respect to this agreement.